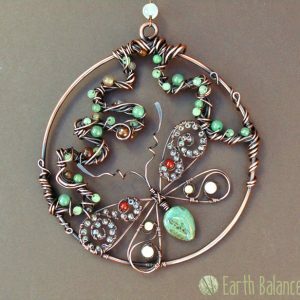 A copper hanging heart decoration with an earthy colour palette of agate, jasper, obsidian, tigers-eye and quartz semi-precious gemstone beads. This pretty love heart can be hung in the home or out in the garden. Inspired by the beauty found in the depths of forest woodland, with rustic textures, a grounding and nurturing feel with warming browns, mottled greens and grounding tones.